Reprints from The Cambridge Magazine. A Poem. This copy Number 256. New York: Crosby Gaige. London: William Heinemann Ltd.
A Poem. This book was printed in a limited edition of 500 copies each signed by the author, this is copy number 169. Verse Poem first published in ‘Good-Bye To All That’ by Robert Graves. Collection of 22 Poems. This copy No 66 of 212. A Collection of 18 Poems, Limited to 107 copies. Two Poems - Limited Edition of 35 copies. Two Poems - Limited Edition of 200 copies, this copy 111. A Poem - A “few” copies were printed. Lenten Illuminations and Sight Sufficient (Keynes A60b), by Siegfried Sassoon, published in 1959 by the Downside Abbey Press. 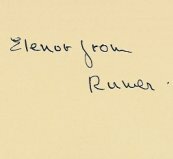 This copy is inscribed to Elenor (Farjeon) from Rumer (Godden). Farjeon (1881-1965) was an English author and Catholic who published many books, mostly for children. She also wrote the song “Morning Has Broken.” Her brother, Herbert, was a conscientious objector and a supporter of Sassoon during the period of his protest. 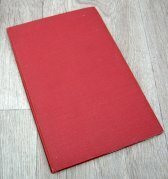 The Road to Ruin, (Keynes A38) First Edition, published by Faber and Faber in 1933. The book is collection of seven poems warning of a future war. This book came with a Review Slip (right) from the publisher asking the recipient to write a review and stating that the book was to be published on November 9th, 1933, at 2/6 net. The slip goes on to request that the review should not appear before the date of publication. Thanks to my wife Mandy who gave me this book today (2011) for my birthday. Counter-Attack and Other Poems, by Siegfried Sassoon, published in October 1918 by William Heinemann. This book is of course not the First Edition which was published in June 1918 in paperback. This is a hardback edition with dust jacket and is interesting because although Keynes states it was reprinted in August 1918 (1,000), September 1918 (1,000), January 1919 (1,500), stating that a total number of 5,000 were printed (including the First Edition); he does not mention this October 1918 edition. It is likely that 1,000 copies were also printed in October, which pushes the total up to 6,000 in all. POEMS Newly Selected, by Siegfried Sassoon, published in 1942 by Faber & Faber. This is an interesting book as Keynes appears to have missed it. He records the First Edition, published on 14th November, 1940, (3,000 copies), and a second issue published on 4th January, 1949, (3,300 copies). Both printed by Western Printing Services, Bristol. This copy is a paperback with dust jacket from the same printers. It is a fourth impression printed in October 1942, and the book also records a second impression, February 1941, and a third in December 1941. Yet again this web site has identified more missing editions from Sassoon’s bibliography. Lenten Illuminations and Sight Sufficient (Keynes A60c) Offprint Limited Edition of 200 copies, by Siegfried Sassoon. Two Poems printed in 1959 on handmade paper by Downside Abbey. Numbered on the front flap of the wrapper, this copy is number 111. Rogation, (Keynes A61), one poem by Siegfried Sassoon. This is an absolute rarity - Keynes states “A single leaf of which a few copies were printed at the Marlborough College Press.” The poem, published in 1960, also contains Sassoon’s manuscript correction to the text. Collected Poems PROOF COPY - By Siegfried Sassoon. First English edition published in 1947 by Faber & Faber. Collected Poems (Keynes A52a), was produced in a run of 10,000 copies. This example is an advance proof copy of which very few exist. The collection included 299 poems from the following: The Old Huntsman, Counter-Attack, Picture Show, Satirical Poems, The Heart's Journey, The Road to Ruin, Vigils and Rhymed Ruminations.